A Shooting sport is a competitive sport involving tests of proficiency (accuracy and speed) using various types of guns such as firearms and airguns. Hunting is also a shooting sport, and indeed shooting live pheasants was an Olympic event (albeit only once, in 1900). 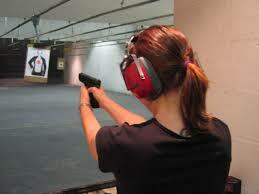 The shooting sports are categorized by the type of firearm, targets, and distances at which the targets are shot.